The last Emir of Bukhara, Said Alim Bahadur Khan (1880-1944), the last of the Uzbek Manghit dynasty, which ruled the Emirate of Bukhara from the eighteenth century until the Russian Civil War, poses solemnly for his portrait taken in 1911 shortly after his accession. 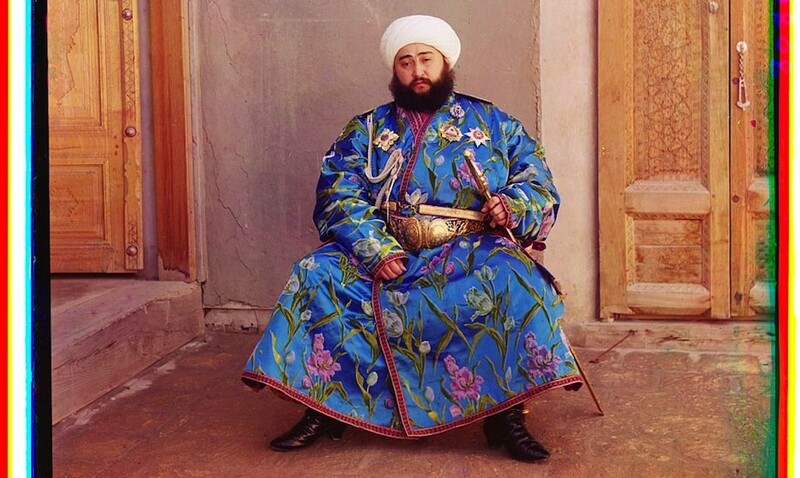 As ruler of one of three autonomous states in Islamic Central Asia (they were Bukhara, Khiva, and Kokand, which together comprised the area known as Turkestan), the emir presided over the internal affairs of his emirate as absolute monarch, even though Bukhara had been a vassal state of the Russian Empire since 1868. Russian interest in Central Asia had been increasing since the middle of the eighteenth century for military, strategic, and trade reasons. In 1867, the Russians conquered Tashkent (present-day Uzbekistan) and set up the Governor-Generalship of Turkestan in order to administer the area. Once the Emirate of Bukhara became a Russian protectorate, Emir Alim Khan signed a treaty of friendship with Russia that granted him a special relationship with the government and the imperial family. In the photograph opposite, the emir wears the epaulettes of a full general of the Russian army, which were awarded to him by the Tsar in grateful thanks for his support of the Russian military. Displayed across his chest are assorted decorations. From the left they are: The Star of the Order of the Crown of Bukhara; an early design of the Star of the Order of Noble Bukhara; the Star of the Order of St Anne, First Class (the presence of an eagle in the centre as opposed to a cross denotes the fact that this Star had been presented to a non-Christian); and finally, at top right, the Diamond Cipher of Tsar Nicholas II which was presented to the emir at Nicholas’ coronation in 1896. The emir wears a ceremonial kamarband (belt) and holds a sword, both of which are emblems of sovereignty. The emir is photographed in an exquisitely woven chapan, the traditional robe worn by both men and women in Central Asia, and made of either silk or cotton. The embroidered silk of this particular robe is thought to be of either European or Chinese origin and depicts a wild array of purple and pale blue tulips. It was the vibrancy of this image that struck Shukria Raad when she saw her father in colour for the first time. The end of the Manghit dynasty followed the capture of the city of Bukhara by the Red Army in September 1920. The emir, who had ruled over three million subjects, and had also accumulated an enormous personal fortune, fled to Afghanistan where he later died in 1944. The photographs in this article are the cropped and retouched versions of the original colour photographs as seen above. 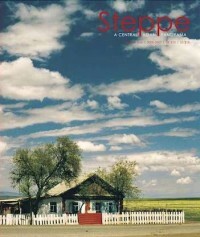 A whole host of these colour photographs and an interview with the daughter of the Last Emir are available when you buy Steppe 1.